Stainless steel body - perfect for boiling and cooking by immersion. Never overheat the product without first adding food: the thermal shock can cause boiling droplets to splash out of the pan. Steel is not non-stick: never leave food to cook unsupervised as it could burn quickly. Salt, lime scale and starch can stain steel. In this case, wipe the pan with a soft cloth soaked in lemon juice. In case of stains from burnt food, boil some water and vinegar (or lemon) for a few minutes to remove the burnt parts. Can I use my stainless steel pan on an induction cook top? Yes. Steel pans can be used on all heat sources. When cooking always be careful not to drag any kind of cooking supply on ceramic surfaces. Is my steel pan dishwasher safe? Yes. Steel pans are dishwasher safe. Why is my pan stained and how do I remove these marks? salt added in cold water. Salt grains in cold water can cause white or reddish stains to form. These stains will not affect the quality or use of the pan in any way and they can be easily removed by wiping the pan with a soft cloth soaked in vinegar, lemon juice or a specific cleanser for stainless steel. Is the steel pan nickel-free? No. A steel pan may contain traces of nickel. Unbeatable together. 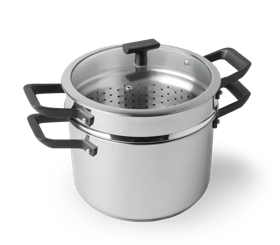 Perfect for boiled dishes, stocks and immersion cooking.